Formula One: Hamilton fastest in Spanish Friday Practice! 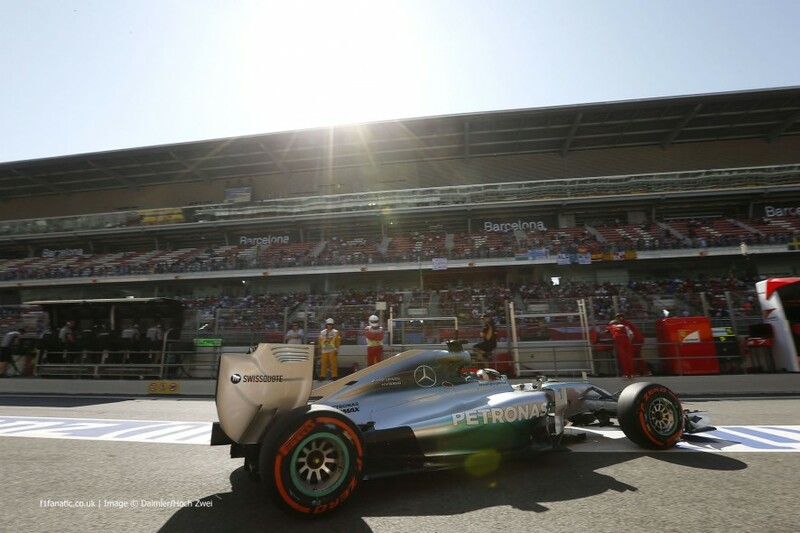 Home » Formula One: Hamilton fastest in Spanish Friday Practice! The first European round of the 2014 Formula One world championship got under-way today with the two Friday Practice sessions at the Circuit de Catalunya in Spain. Lewis Hamilton, who has won the last 3 Grand Prix in a row, topped both 90 minute sessions is showing every sign of winning his 4th race out of 5 this season. Practice 1 began with home hero Fernando Alonso claiming the top spot as he threw his Ferrari around the circuit. He would later be deposed by Jenson Button who led the session all the way until the final few minutes when Hamilton put in two fastest laps in a row to take the fastest time by 8 tenths of a second. Alonso ended up in P4, just behind Daniel Ricciardo in the Red Bull. Alonso discredited the chance of a podium in yesterday’s press conference and commented that he would need luck to be able to do so. Nico Rosberg had an unproductive first session after his team discovered a problem with the energy recovery system on his Mercedes. As a result he only completed 9 laps and was 5th fastest. Kimi Raikkonen and Kevin Magnussen were 6th and 7th fastest ahead of a surprise flash of pace from 2012 Spanish GP winner Pastor Maldonado. The Venezuelan has had a tough start to his 2014 season but briefly held 3rd and set the most amount of laps of anyone in the first 90 minutes. Daniil Kvyat completed the top 10 for Toro Rosso. Sebastian Vettel had a torrid first session, with the reigning champion only completing 4 laps before his Red Bull broke down with a suspected electrical problem. The team later went on to announce that they would not take part in the 2nd practice session so that they could concentrate on trying to get the car fixed. Giedo van der Garde made an appearance in FP1 for Sauber and had a scary moment at turn 1 when his brakes failed. He narrowly missed the barriers at turn 1 and managed to recover the car to the pits. 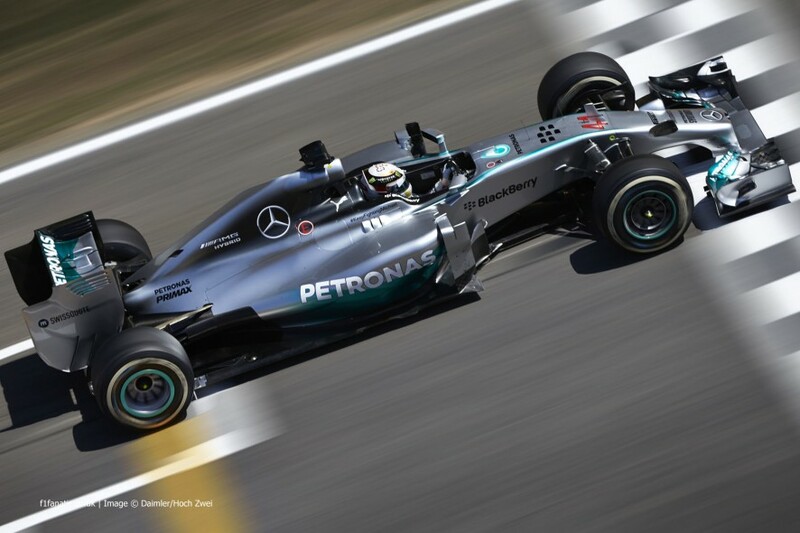 Lewis Hamilton continued to dominate practice by once again setting the fastest time. Team-mate Nico Rosberg had taken the top spot, but only for less than a minute before Hamilton set a time that was 4 tenths faster. Daniel Ricciardo and Fernando Alonso remained in 3rd and 4th place, with Ricciardo the only driver that was under a second slower than Hamilton. Kimi Raikkonen was 5th fastest and was just over a tenth slower than his team-mate in 3rd. Kevin Magnussen was 6th fastest, but was still 2 seconds slower than Hamilton in P1. Magnussen was a few thousandths quicker than team-mate Button in 7th and Felipe Massa in 8th for Williams. Maldonado had another strong practice and was 9th fastest ahead of Kvyat; who once again completed the top 10. Jean-Eric Vergne and Max Chilton hit problems in the final minutes of the session, with Vergne losing a wheel at turn 2 and Chilton beaching himself in the gravel at turn 4 after locking up. Vergne’s runaway wheel cost the Frenchman dearly as the stewards handed him a 10 place penalty for the race on Sunday.